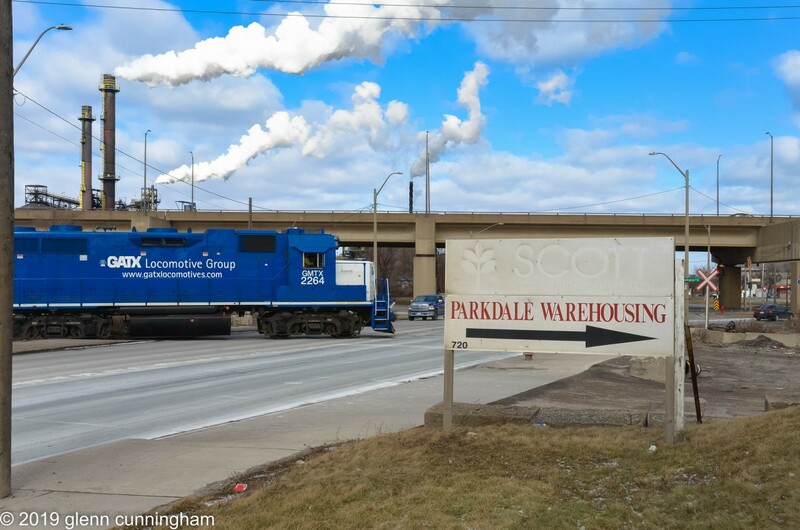 Railpictures.ca - Glenn Cunningham Photo: Saturday afternoon switch at Parkdale Warehousing in Hamilton’s “far east” industrial area. CN is using GMTX 2264 and CN 7046 to pickup a single boxcar from the stub end track. Once ready, the crew will protect the crossing and head back to Stuart Street. | Railpictures.ca – Canadian Railway Photography – photographie ferroviaire Canadienne. Caption: Saturday afternoon switch at Parkdale Warehousing in Hamilton's "far east" industrial area. CN is using GMTX 2264 and CN 7046 to pickup a single boxcar from the stub end track. Once ready, the crew will protect the crossing and head back to Stuart Street. I’ve seen them here a few times now, so it’s definitely a daylight move now with CN. They seem to get pretty frequent service too from what I have observed. A neat place and a neat move. Nice shot.